You may have crossed a hundred of bridges in Vietnam. But have you known that bridges are the outstanding features of Danang, also known as “the city of bridges”? Besides the huge number, the bridges in this city attract visitors by unique historic architecture and their stories. The most famous couple of bridges is Han River bridge and Dragon Bridge, also the top attractions in Danang. Crossing Han River, these are the top tourist attractions which appeal to thousands of tourists yearly. With Inspitrip, discover some facts about these two and tips for an amazing visit that you should not miss out. Building in 1997 and opened in 2000, Han River Bridge (Vietnamese: Cầu Sông Hàn) is known as the first modern bridge designed by Vietnamese architects and local workers, also, the first swing bridge ever in Vietnam. Becoming a significant cultural spot, it not only helps facilitate transports and promote tourism but also boosts the growth of the economy of the city. The bridge retains 487.7m long, 12.9m wide and consists of 11 spans with 33m long each. The structure of beams is entirely steel while the bridge deck is reinforced with concrete. An interesting fact of this bridge is that every day, in the middle of the night, traffic will be stopped from crossing Han River Bridge in order to open the way for large ships to pass along. Thus, the bridge will rotate 90 degrees from its axis at around 1:00 am and stay along the river’s flow until 3:30 am before coming back to the initial position. Have you ever noticed the changing light reflection on the Han river at night? Have you ever wondered what makes the Han river different colors at different times of the day? Han river bridge can answer to things you wonder about. Indeed, when the city lights up, Han River Bridge becomes most splendid and reflects its light swings on the water surface. It is an ideal place not only for wandering, but also immersing yourself in local’s daily life or just simply enjoying the dreamy atmosphere. I can only imagine the feeling of standing on a mythical bridge, observing the sparkling reflection on the river and enjoying the cool breezes blowing on your face while staring at the night sky full of stars. How cool is that! 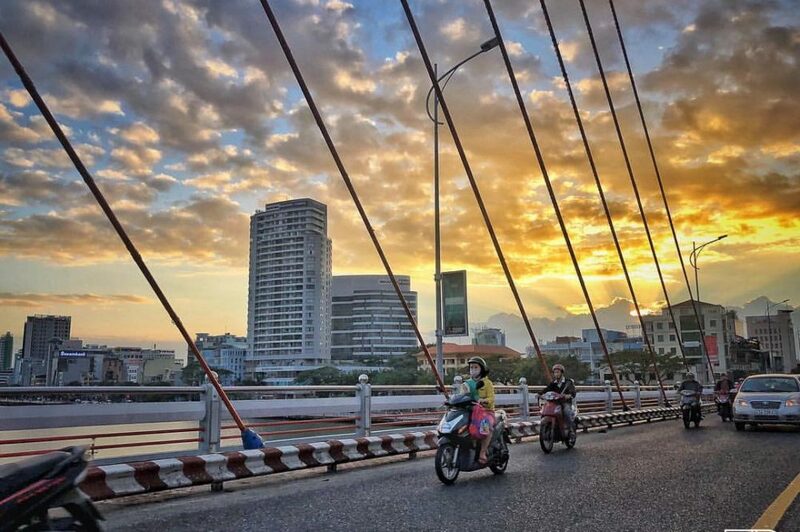 Because you will take time to get there, there are two recommended plans which combine the bridge visit with other exciting activities: riding a motorbike around Danang or having a nice walk from the night market. 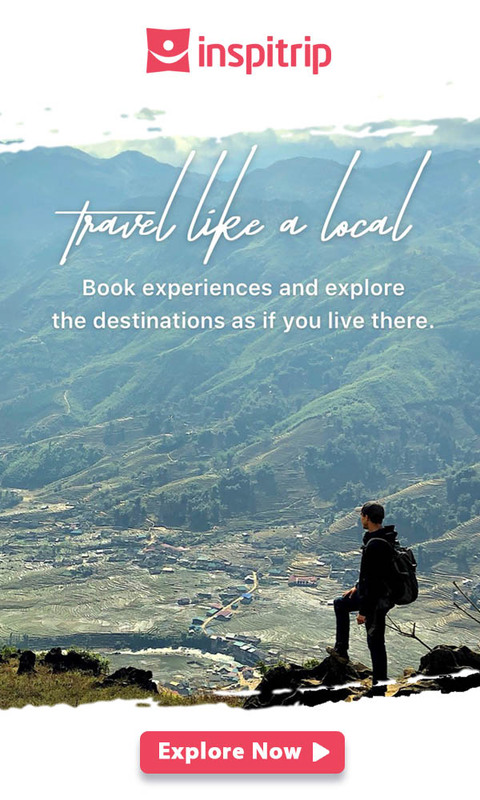 With the first option, you can spend your whole day in the city doing a variety of interesting activities that Danang offers, such as riding a motorbike on the street, visiting a number of historic museums and having some delicious street food. After the adventure, go to the bridge to relax, watch the beautiful sunset on the Han River bridge and have a delicious dinner at a seafood restaurant nearby. Another option is to spend time at the bridge after visiting the humming, buzzing Han market, which locates right in the middle of the city. It is only a chilly 5-minute walk from the market to the bridge, so I myself often choose to walk down Tran Phu street and enjoy the exquisite night scenes on this long-established crowded local street. Designed by the US-based Ammann & Whitney Consulting Engineers with Louis Berger Group, Dragon Bridge (Vietnamese: Cầu Rồng) illustrates the image of a dragon flying towards the sea with the architecture inspired by Ly dynasty. It was opened on the 38th anniversary of the liberation of Danang city in 2013. The bridge shortens the route between Da Nang international airport and the luxury coastal resorts Son Tra – Dien Ngoc, as well as My Khe beach and Non Nuoc beach. Improving the transport infrastructure and building a new architectural figure of Danang city, the local authority has successfully made this unique bridge become one of the most popular tourist attractions in the city. Danang Dragon Bridge has a total length of 666 m and width of 37.5 m, which consist of 5 main spans, 6 lanes for vehicles and 2 lanes for pedestrians. The bridge is made of steel with a total amount of approximately 9,000 tons, including the heaviest steel beams weighing up to 144 tons. The fabrication of steel beams was built by the imported materials from Korea. Until now, this is still considered as one of the most special dome structures in Vietnam. The most special thing about Danang Dragon Bridge is that the dragon can breathe fire and water, which makes incredible performances along the river. The performance will start at 9 pm at the weekend and on holiday. Danang citizen believes that the water spraying in a powerful blast reflects the inner energy of Danang city. Standing on the bridge: Nowhere but this place that you can enjoy the performance in the clearest view. However, you could jostle through the crowd to find the best position when the show starts. Best tip is going earlier the show time to save a nice spot for the best watching experience. From Tran Hung Dao Street & Bach Dang Street: Dear passionate photographer, it is the best choice for you. From those streets, you can easily capture the full view of the fire-breathing dragon. From the rooftop of riverfront bars, restaurants, and cafes around: Nothing is better than enjoying the show, having iced coffee/fresh juice and listening to a jazz song. I assure it will be one of the most unforgettable memories you have ever had. Given the prime location with the convergence of mountains, rivers, waters and a variety of amazing sight-seeings, Danang city is embellished with a powerful image by the appearance of architectural bridges like Han River and Dragon Bridge. All in all, traveling in this city will absolutely be incomplete without these brilliant masterpieces. Besides these top attractions in Danang, there are more breathtaking bridges that you can discover in a cruise and immerse yourself in the mysterious atmosphere of the Han river. Enjoy your fantastic day full of activities on the river. Don’t miss out any travel highlights and tips for this “city of bridges” with Inspitrip!